Always look as though you're ready to misbehave. 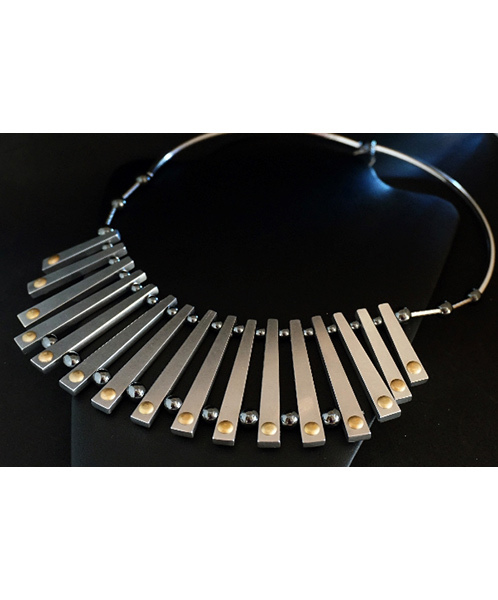 The Miss Behavin' Collar Necklace is hand made in Colorado by former Marine Jerry Moran of Criffin Designs using new and repurposed aircraft aluminum and other materials. The necklace measures approximately 17" long and is made with light weight Aircraft Aluminum, AD Rivets stamped with the artist's mark, Hematite and Sterling Silver. The Miss Behavin' Collar necklace by Criffin Designs is named after the nose art that is featured on many WWII and Korean War aircraft.